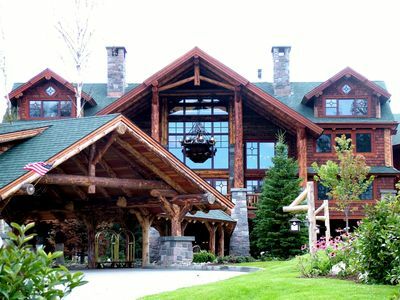 Book 'Basecamp Lodge' for your next outdoor-centric getaway in Lake Placid, New York! 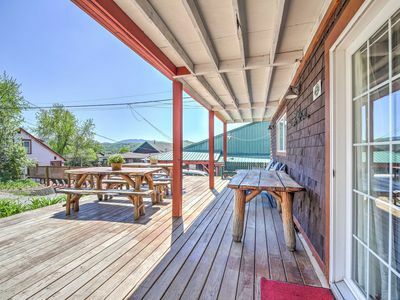 As the newest vacation rental of the High Peaks Cyclery and Guide Service property, this home boasts a modern living space and sleeps up to 12 guests with 2 baths and 6 bunks in 3 bedrooms. 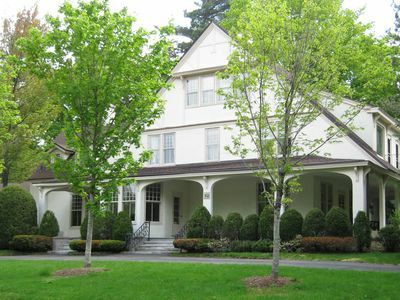 Walk to the beach on Mirror Lake, visit the Olympic Center, and much more! 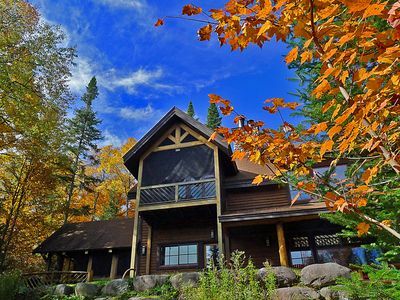 Whether you're looking to enjoy the Adirondacks during the winter or for a summer getaway, this home is sure to be perfect for you. 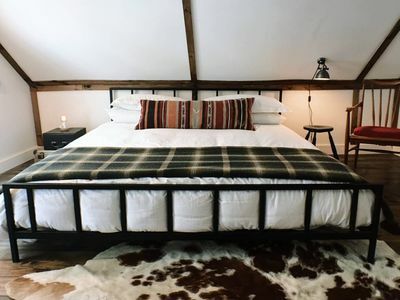 This private lodge makes it easy to unwind and retreat to bed after each adventure, as all 3 bedrooms are located directly off the large living room and kitchen area. 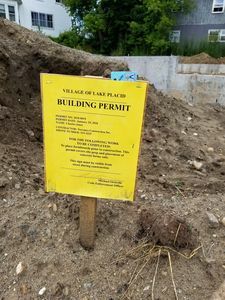 During your stay, enjoy access to the on-site wax room and bike storage, as well as the yoga studio and rock climbing wall next door. Whip up gourmet recipes in the open, fully equipped kitchen featuring a center-island prep space, tile floors, custom lighting, and all the essential appliances and cooking utensils for your home-cooking needs. Once all the fixings are prepared, set the farmhouse-style table to share a family feast. 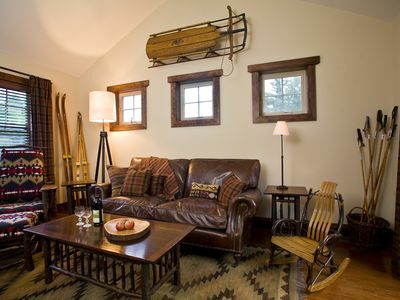 Relax on comfortable leather furnishings in the living room, connect to the complimentary wireless internet, pick out a board game to play, or watch favorite shows and movies using the flat-screen cable TV and DVD player. 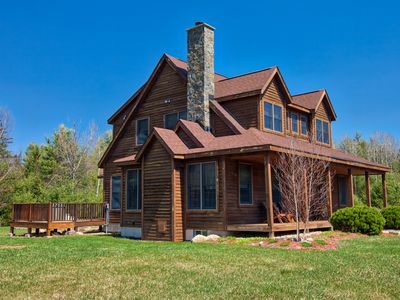 This home also includes an expansive private deck with a gas grill to host afternoon barbecues on vacation, while the stunning High Peaks vistas provide the perfect backdrop for quality time outside. 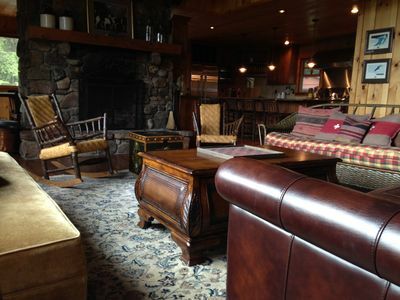 'High Peaks Basecamp Lodge' rests on the one-of-a-kind High Peaks Cyclery and Mountain Guides Service. Head down to the shop in the morning and rent outdoor gear such as fishing, bikes, canoes, kayaks, skis, and snowshoes at a discounted rate. 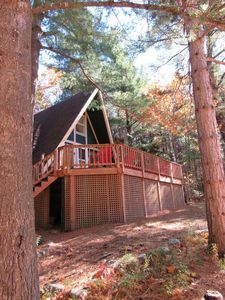 The owners also offer professionally guided trips into the Adirondack Mountains for great adventures throughout your trip! 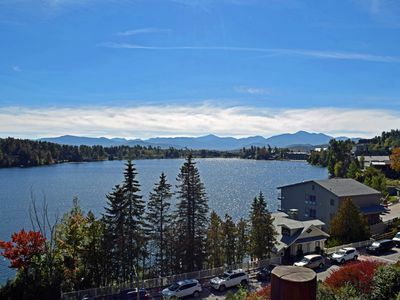 Enjoy an ideal, central location within walking distance of the Lake Placid Public Beach on Mirror Lake, and near many of the delicious local eateries and boutique shops. 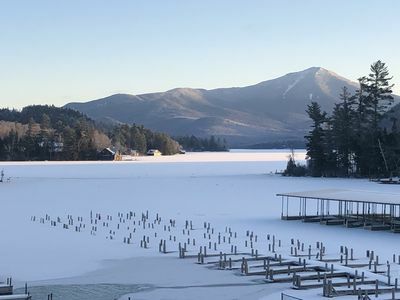 The Whiteface Lake Placid Olympic Center is just about a block from the home and hosts several exhibits and sporting events throughout the year. 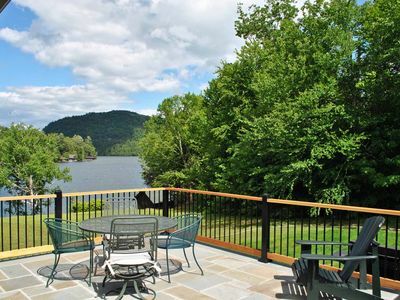 Drive a little further for more waterfront activity along Lake Placid, just about 2 miles away. 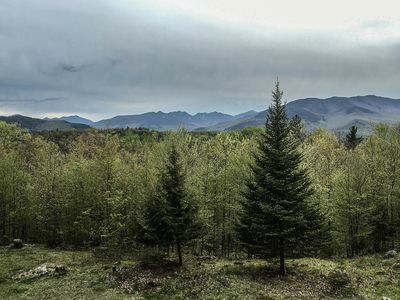 Afterward, climb Mount Jo for spectacular views of the High Peaks, where miles of scenic hiking trails lead you through the Adirondack Mountains. Test out your Nordic skiing skills on 50 km of world-class trails at Mt. Van Hoevenberg, about 7 miles away. 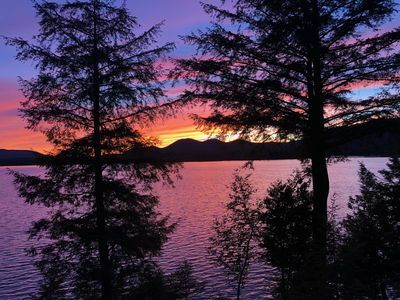 The 50-km Jackrabbit Trail runs from Keene, through Lake Placid to Paul Smiths, and connects 4 ski centers and backcountry routes for an unforgettable cross-country skiing experience. 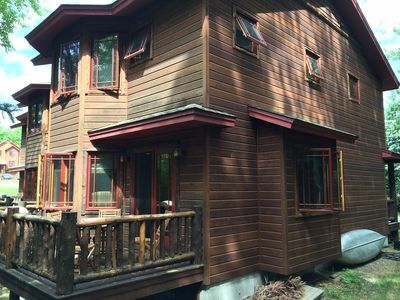 - Amazing Lake Placid location in the High Peaks Cyclery and Guide Services property - Walk to local shops, restaurants, and the Public Beach on Mirror Lake. 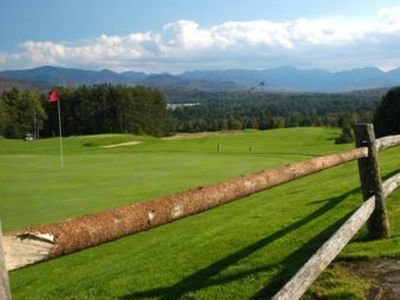 Visit the Whiteface Lake Placid Olympic Center, and drive just 2 miles to the Lake Placid Shore! 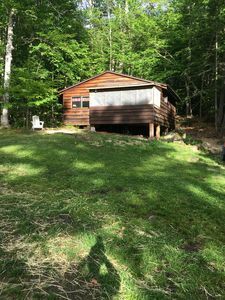 One bedroom cottage - Family owned/operated since 1923. 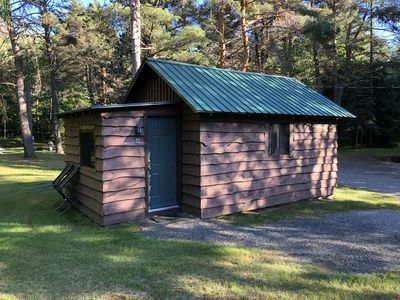 5 minutes to walk to Lake Placid Main Street, 3 to the Lake ! 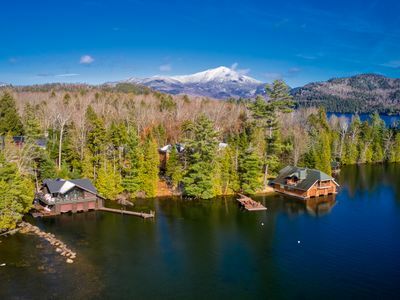 A charming four season residence on the shores of Lake Placid.